Land Rover celebrated 68 years of history today as the last of the current Defenders was produced at its famous Solihull production facility. To mark the occasion, more than 700 current and former employees gathered at the famous Solihull plant to see and drive some of the most important vehicles in the Defender’s history, including the first pre-production ‘Huey’ Series I. As part of the celebration the last vehicle off the production line, a Defender 90 Station Wagon painted in Aintree Green, led a procession of 25 unique vehicles from the Defender’s history around the Solihull Plant. 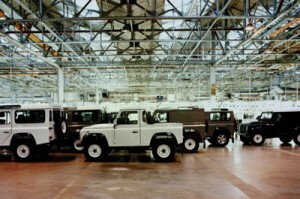 It is at this production facility that the Series Land Rover and Defender vehicles have been continuously built for 68 years. As a way to further mark the rich history of the Defender, fans are being asked to upload the most memorable journeys ever taken in Series Land Rover or Defender vehicles via the online ‘Defender Journeys’ platform. Announced today, the online platform will serve as a ‘digital scrapbook’, collating as many exciting adventures as possible onto the online map. Viewers will be able to view and share iconic journeys from the past and add their own. On the day that marks the end of production for the current Defender, Land Rover has also announced a new Heritage Restoration Programme. Based on the site of the existing Solihull production line, the new programme will see a team of experts, some of whom will be transferred across from the existing Defender production line, restore a number of Series Land Rovers sourced from around the globe. Sale of these vehicles will begin July 2016.